To wrap up my posts about Medieval fashion and before I move on to Renaissance costume, I decided to share some illuminations from the Middle Ages that colorfully depict the fashions worn then. Most of these are from the later Medieval period because there are little detailed images from the early Middle Ages. The image below is from Jacques de Longuyon’s Vows of the Peacock, an illuminated manuscript from around 1350, and depicts nobles playing chess. It shows the dagged chaperons and buttoned cotehardies as well as the pointed poulaines worn by men. The women wear cotehardies, some with sideless surcoats over them and some with dalmation sleeves. The following image is from an illuminated calendar from around 1410 called Les Très Riches Heures du duc de Berry. This specific illumination is for the month of April and depicts noble men and women with the Chateau de Dourdan in the background. The men wear large houppelands with dagged dalmation sleeves. The women wear fashionable high-waisted gowns with large dalmation sleeves as well as rolled hennins in various styles. This next image is a painting called “The Arnolfini Portrait” from 1434 and is by Jan van Eyck. Although his painting style is much more similar to Renaissance art, the fashions depicted are still Medieval. The man wears a fur-lined tappert over a black cotehardie and a wide-brimmed hat. The woman wears a wimple over her hair as well as a green, fur-lined, high-waisted gown with slashed sleeves over a blue cotehardie. 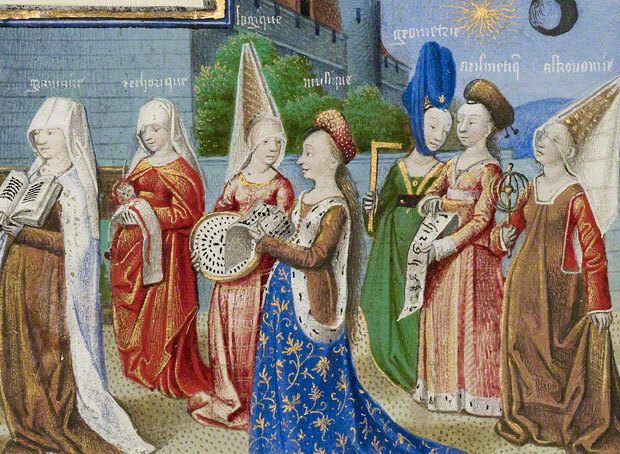 The below image is a painting called “Philosophy Presenting the Seven Liberal Arts to Boethius” from the manuscript The Consolation of Philosophy. It is from around 1450, at the end of the era of Medieval fashion and just before the Renaissance started changing clothing. The women wear a variety of gown styles, including sideless surcoats over cotehardies and the v-necked, high-waisted “Burgundian” gown. They all wear either wimples or hennins in different fashions, some veiled. Excellent post, very informative and aided clearly by the colourful portraits. I looking forward to your posts about Renaissance costume. What a great resource you have here, thank you! I am curious what you make of the costumes in the recent series The White Queen (UK TV)? I certainly thought they were beautiful and well done but I probably don’t have quite your eye for detail! Hello, thanks for stopping by! I also enjoyed the gorgeous costumes in The White Queen series. They were pretty spot on when it came to dresses for the female characters, with the high waistlines and the dalmation sleeves. However, they definitely neglected accuracy when it came to hair arrangements and headdresses. Women of the court, especially married women, would never wear their hair loose down their backs, as that was a sign of youth and girlhood. They would have worn elaborate hennins and cauls to further display their wealth and rank (Duchess Cecily and Jaquetta are the only characters who really do so). The men were also quite hatless in public, also an uncommon display for the time. Besides this issue, however, I found the costumes to be quite accurate and certainly eye-catching!